Riddle me this, riddle me thus - who will be the next Batman TV bust? 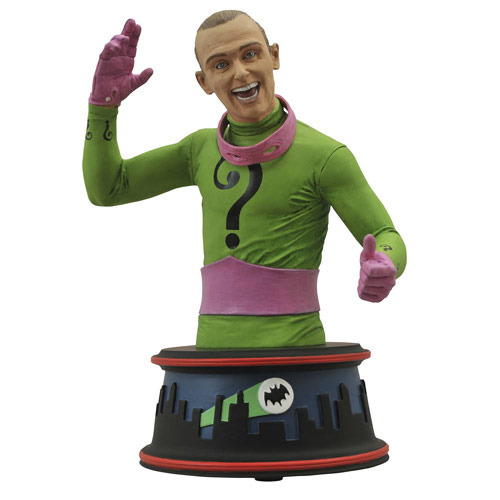 The Batman 1966 TV Series Riddler Mini-Bust, as played by Frank Gorshin, is the fourth in DST's line of resin busts based on the Batman classic TV Show! Joining the Joker in the ranks of Batman's greatest foes, this bust of an unmasked, unhinged Riddler measures approximately 6-inches tall atop a base inspired by the show's famous opening animation. It's the answer to what to get if you're a Batman fan! Packaged in a full-color box. Designed by Barry Bradfield and sculpted by Jean St. Jean. Limited of 3000 Pieces.